If you’re like many folks, you probably have a lot of stuff and too little space. The Amazon-ification of our lives has made consuming nearly effortless, leaving us with a bunch of crap we probably don't use. Our digital world has expanded the sharing of everything from cars and homes, music and even jobs. But stuff — in particular, the kind that spends most of its lifespan in closets, basements and garages — hasn’t been as easy to borrow at the push of a button. Now, local start-up Funspree is creating an on-demand service for people looking to rent things they rarely use — but would love to get their hands on for a few days. You're probably not in the market for tandem paddleboards or 8-person laser tag — although it sounds like a good time, right? Funspree will lend you the gear, allowing you to focus on having a good time and not worrying about cost and storage. Emily Glynn-James, a Leslieville local who founded Funspree along with her partner, Tyler James, says the idea is simple: being able to do more and own less. "Funspree makes it easy and affordable for folks to get their hands on the gear they need to organize unique and memorable experiences," James says. "We want to make it possible for you to open your phone and with the press of a button have a really compelling experience delivered to your door that you can enjoy with friends and family over an entire weekend." The company has launched with four experiences that they'll deliver to your door and pick up four or 11 days later. They're even throwing in a deal for locals to save 10% on their first order by using promo code GOODHOOD10. Planning a camping trip? 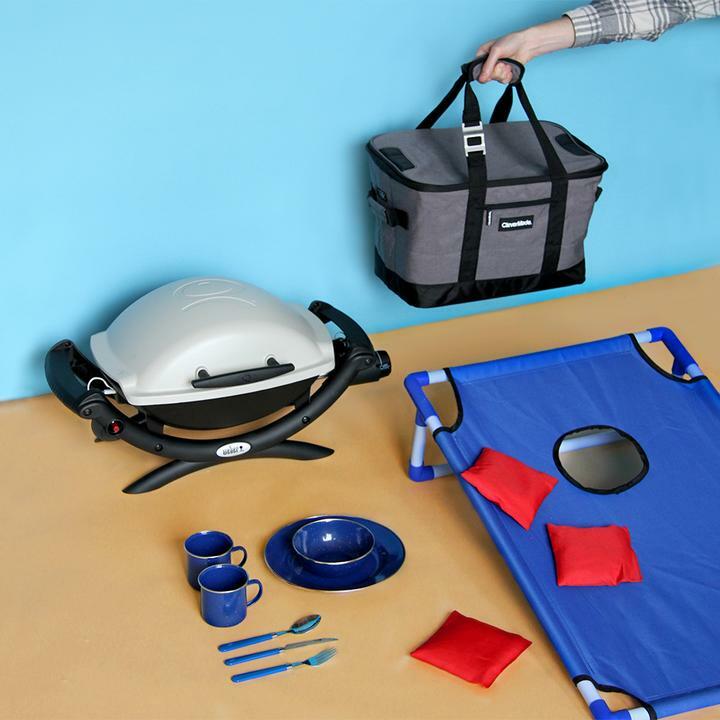 Funspree delivers a "glamping" package with tent, airbeds, portable bbq, chairs, cooler, blankets and even a corn hole game set. Want to host a backyard movie night? Get a projector and massive 10-foot screen delivered to your door, plus chairs, a lounger, blankets and even an old-timey popcorn machine. The best part is that you don’t have to buy the stuff to throw your next party or plan your next outdoorsy getaway, only to stash it in a closet and hardly ever use it again. You can borrow it. "The world needs more reasons for people to look up from their screens and come together around shared experiences," she says. "It's important to us that our experiences be affordable too, which is why we're proud that each of our four-day experiences cost less than an average single-game upper-bowl ticket to see a Maple Leafs home game." Funspree is betting on three mega trends: First, the idea that status will increasingly be defined by the experiences we have, not the things we own. Second, the idea that the next generation of consumers are questioning traditional ownership models. And lastly, that collaborative consumption can make a difference to our planet. So how does it work? The process is easy: Go to TryFunspree.com, reserve an experience, Funspree drops it off at your door and picks it up. You keep the memories, not the stuff. Funspree is currently in beta mode, testing out its offering with the east end community. As a result, the delivery zone is relatively tight. Deliveries are made on Thursday and Fridays from 5:30 p.m. - 11 p.m. 4-Day Experiences delivered on Thursdays are picked up by Funspree the following Monday. 4-Day Experiences delivered on Fridays are picked up the following Tuesday. Want to have some fun? Use promo code GOODHOOD10 at checkout for 10% off your first experience with Funspree.